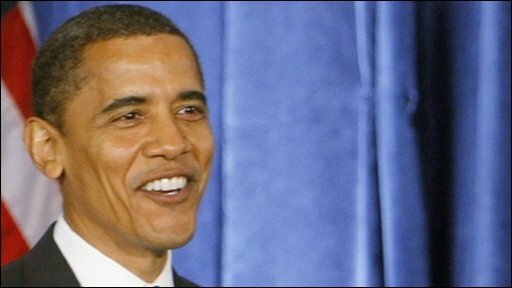 US President-elect Barack Obama is still working on the make-up of his cabinet. A far more important decision - for his daughters at least - will be choosing the puppy that accompanies the new First Family to the White House. Mr Obama made the promise of a new pet to Malia, 10 and Sasha, seven, in an election victory speech broadcast to millions around the world, suggesting it is one campaign pledge that will be kept. "I love you both so much, and you have earned the new puppy that's coming with us to the White House," he told his daughters. Now what everyone wants to know is, what kind of pooch will be the next to join a long and illustrious line of White House pets? Asked that question in his first news conference since being elected, Mr Obama said there were two priorities: to have a "hypoallergenic" breed that sheds less hair, because daughter Malia has allergies, and to have a rescue dog. The problem, he said, was that lots of rescue dogs are "mutts like me" - a reference to his mixed ethnic background - rather than specific breeds. "Whether we're going to be able to balance those two things, I think, is a pressing issue on the Obama household," he said. Hypoallergenic options could include a labradoodle - a cross between a Labrador and a poodle - a schnoodle (schnauzer and poodle), or a cockapoo (cocker spaniel and poodle). Malia, however, is rumoured to favour a goldendoodle - a poodle crossed with a golden retriever. In an American Kennel Club survey of 42,000 people this summer, a pedigree poodle came out as the top choice for a new First Dog. But Tamar Geller, a California-based celebrity dog "life coach" who trained Oprah Winfrey's puppies, says she is confident the Obamas will take a rescue dog. She says staff at her shelter programme, Another Chance For Love, are already in talks with people in the Obama camp about a goldendoodle that needs a home. "He is a gorgeous dog," she told the BBC News website. "He is white with some golden highlights, as if he went to the hairdresser, a really happy smile, sweet but not hyper. "I think he is going to make a perfect First Dog but we will see - the family has to make the decision." The priority, she says, is that the pet the Obamas pick is comfortable with children and impeccably behaved at all times, particularly with visitors. "Can you imagine the dog jumping on Putin, or lifting his leg and peeing on the curtains, or nipping at Gordon Brown?" she says. "We don't want that to happen, so the dog has to be very well mannered. Leigh Siegfried, of the Opportunity Barks dog training school, based just outside the capital, agrees that sociability is a must. 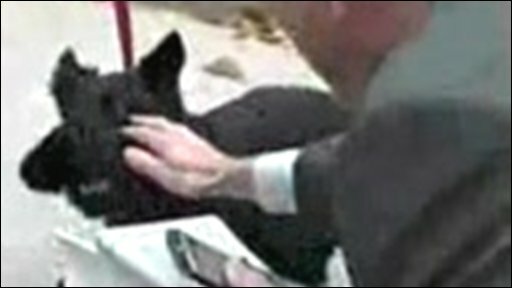 The reporter bitten on the finger by George W Bush's dog Barney this week would probably agree. Whether pedigree or mutt, the new First Puppy will have to take over certain duties from Barney and his companion Miss Beazley, both Scottish terriers. They are regularly photographed travelling with the Bush family, playing on the White House lawn and meeting and greeting visitors - including royalty. Barney has his own website and the hairy pair have also starred in the annual White House Christmas video. Last year's included a cameo by former UK Prime Minister Tony Blair, at one time mocked as "Bush's poodle". If times get tough for Mr Obama on the political front, the First Puppy might also bear in mind the quote attributed to President Harry S Truman: "If you want a friend in Washington, get a dog." 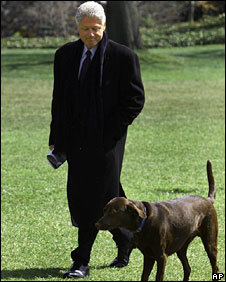 Bill Clinton's chocolate Labrador, Buddy, probably lived up to his name when he joined the household in 1997 at the height of the Monica Lewinsky affair. And Mr Clinton once told reporters that the dog would curl up and sleep with him when wife Hillary was away. Some previous presidential pets have been more exotic. Herbert Hoover (or his son, at least) owned two alligators that were sometimes allowed to roam round the White House. George Washington was devoted to his war horse, called Nelson, and Martin Van Buren had two tiger cubs. According to the White House website, Thomas Jefferson kept a mockingbird, Calvin Coolidge had a pet raccoon called Rebecca and Benjamin Harrison owned a goat called His Whiskers that pulled his grandchildren round the White House lawn in a cart. The sons of Theodore Roosevelt took their pony up in a White House lift to visit their sick brother in bed and Caroline Kennedy also had a pony, called Macaroni, that she rode across the grounds. In fact, only a handful of US presidents so far have not had a pet. Once the Obamas have chosen their puppy, the next challenge for the 44th First Family will be picking a suitable name. Some internet First Pet-watchers are already bandying about such monikers as Lipstick or Palin, if it is a pit bull terrier, or perhaps Maverick if the Obamas opt for an older rescue dog. Recent presidents have tended to go for straightforward dog names. 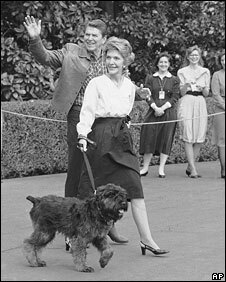 Lyndon Johnson called his beagles Him and Her, Jimmy Carter's pooch was called Grits and Ronald Reagan named his dogs Lucky and Rex. George W Bush's springer spaniel - born in the White House while his father had the top job - was dubbed Spot. Mr Clinton said he had named Buddy after his great-uncle Henry Oren "Buddy" Grisham, who had died earlier that year. In the end, whatever name the Obamas plump for, Ms Geller says, she just wants to see a crossbreed rather than a commercially-bred pedigree pup as top dog. "It would be really great to get a goldendoodle in the White House. It would be another first."